The transactions done in the high denomination is known as high value transactions. All high value transactions are tracked closely by the Income Tax department. It is mandatory to report all high value transactions in the prescribed format by the banks and all other financial institutions. The prescribed format is called as a Form 61A or Annual Information Return (AIR). Any mismatch found in Income reported in ITR vs investment/expenditure may lead to Income tax notice. So, you need to be very careful while doing financial transactions. If anyone deposit cash aggregating to Rs 10 Lakh rupees or more in a year in any savings account it is called as a high value transaction. A Cash deposit aggregating to Rs. 50 Lakh or more in a year in one or more current account of a person. A Cash withdrawal aggregating to Rs. 50 Lakh or more in a year in one or more current account of a person. A cash deposit in any bank account above Rs. 2.5 Lakh after note ban i.e from 9th Nov, 2016 to 30th Dec, 2016. A cash deposit in current account above Rs 12.5 Lakh after note ban i.e from 9th Nov, 2016 to 30th Dec, 2016. One or more term deposit (other than renewal) aggregating to Rs. 10 Lakh or above. Credit card payment aggregating Rs.2 Lakh or above in a year is also considered as high value transaction. An expense in foreign currency via debit card, credit card or traveler’s cheque for the amount exceeding Rs.10 Lakh or above in a year. A receipt of amount Rs.1 Lakh or above in a year for the purchase of shares issued by the company. A receipt of amount aggregating to Rs.5 Lakh or above in a year for the purchase of bonds, debentures. Cash payment received for the amount exceeding Rs. 2 Lakh for the sale of goods or services by professional. Who is responsible for reporting high value transactions? The list of third parties responsible for reporting high value transactions mention above are given below. All these third parties need to file Form 61A also called as Annual Information Return. This is as per section 285 BA of Income Tax act 1961. This document contains information about transaction including a name of the person and PAN card number. How to track your High Value Transactions? All high value transactions reported by third parties are visible in Form 26 AS. Form 26S is a consolidated annual tax statement issued by the IT department every year. You can download Form 26AS from Income tax filing website. Form 26AS shows how much tax is credited to your account from various sources like salary, pension, interest income etc. Apart from this Part E of Form 26AS contains AIR transaction information. Example – Following example shows AIR Transaction for the purchase of Mutual Funds unit more than Rs.2 Lakh. The details of cash deposited in your accounts can also be obtained from Income tax e-filing website. In order to know all cash deposit in your account login to e-filing portal and click on “Compliance” menu. You will find a tab called as “Accounts with Cash Transactions”. In order to avoid income tax notice or scrutiny you should do following things. You should pay income tax honestly based on applicable tax slab. You should disclose your correct income in ITR. 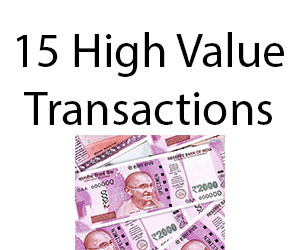 Check part E of 26 AS for high value transactions. If it is necessary to do high value transaction you should be in a position to justify the source of income. You should mention PAN card details while doing high value transactions. Remember consequences of doing high value transactions is very scary. It may lead to income tax notice, penalty, and scrutiny. Be careful in doing high value transactions. « Micro ATMs – How it is different from other ATMs? Firstly thank you such a nice and detailed article. I have a query: in the example AIR Transaction for an AMC’s mutual fund transaction, it looks like a single investment made which is beyond 2 Lacs single payment by cheque. Does the AIR transaction for a mutual fund from a specific AMC even if we do SIPs that cross over 2 Lacs in a financial year? Request you to check 26AS all high value transactions are reflected in 26AS. Usually it is reported by AMC which is lump sum single payment. I have a plot in my hometown. The market value for that is 12lacs but the registration value is 6 lacs. How can I handle this situation? Do i have to sell the property to 6 lacs? You can sell your property as per market value 12 Lac. Make registration paper of 12 Lac and pay tax on the same.